Sulfide and oxides charge referenced to adventitious C1s peak at 284.8eV. W4f region has well separated spin-orbit components (Δmetel=2.17eV). Loss feature for W metal appears at 37eV and 42eV for WO3. W metal loss feature overlaps WO3 4f peaks. Peaks in the W4f region have an asymmetric peak shape for tungsten metal. 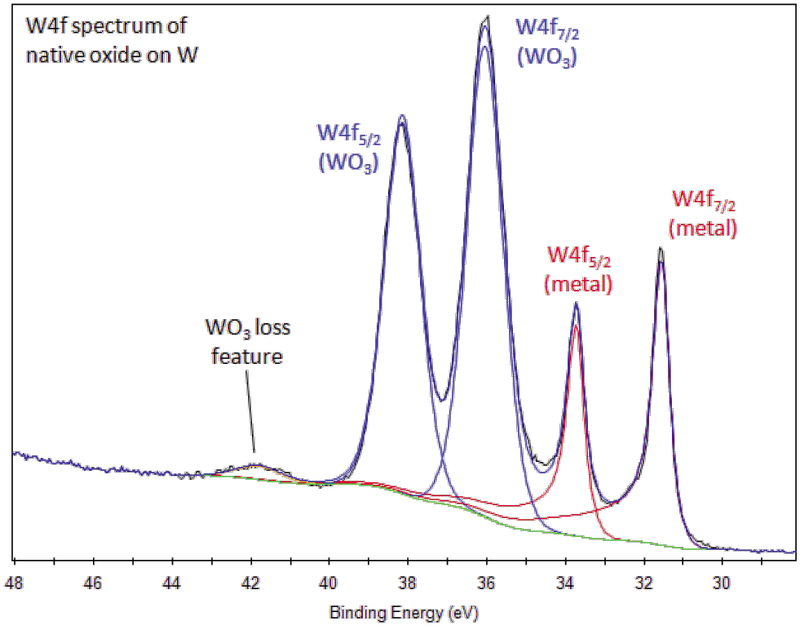 Tungsten compounds, such as the oxide, have symmetric W4f peaks. Use Smart background when sputter profiling films such as WO3 on W.
Linear or Shirley background which is suitable for WO3, for example, will not be suitable for W metal. Tungsten oxide is reduced by an argon ion beam to form a continuum of oxidation states. Use lowest beam energy possible for depth profiling or cluster source to clean (if available). 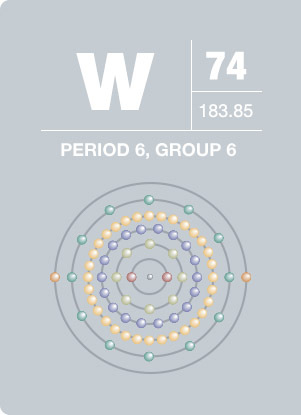 Tungsten’s symbol, W, originates from its former name “wolfram”. Tungsten is found in ores including wolframite, which was named after Peter Wolfe who first hypothesized the existence of tungsten in wolframite. It is extremely resistant to corrosion and forms a protective oxide when exposed to air. The largest use for tungsten is as tungsten carbide used in cemented carbides (wear-resistant materials used in metal working, mining, petroleum, and construction industries). Because it can be made into very thin wires and due to its high melting point, tungsten is applicable in light bulbs, vacuum tube filaments and electron guns. Tungsten salts are also used in the tanning industry.